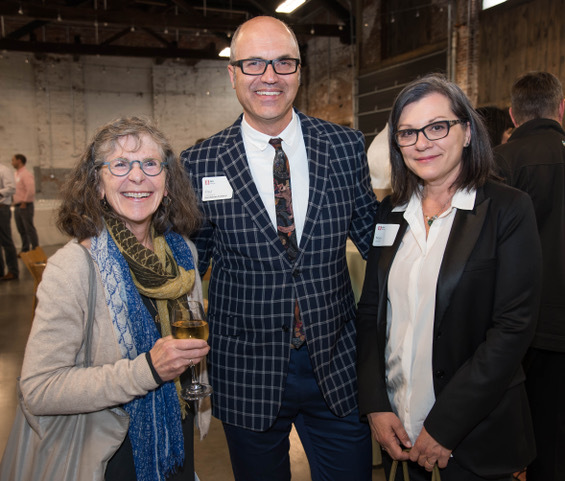 The historically biennial event will be moving to an annual format starting in 2019. 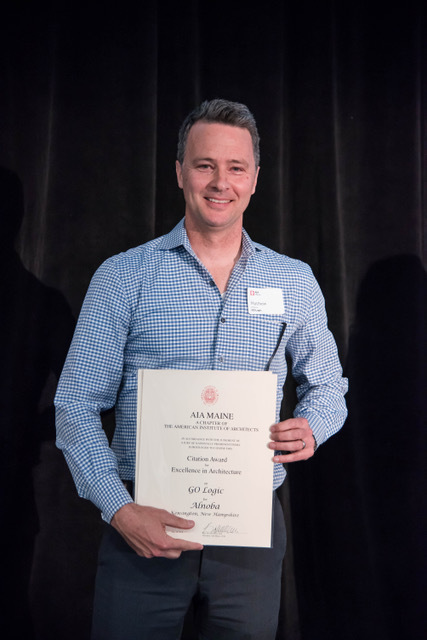 Matt O’Malia of GO Logic accepts the award for Alnoba. Austin Smith of Scott Simons Architects accepts the award for the Brattleboro Music Center. Scott Simons of Scott Simons architects accepts the award for Shimmield Residence Hall. 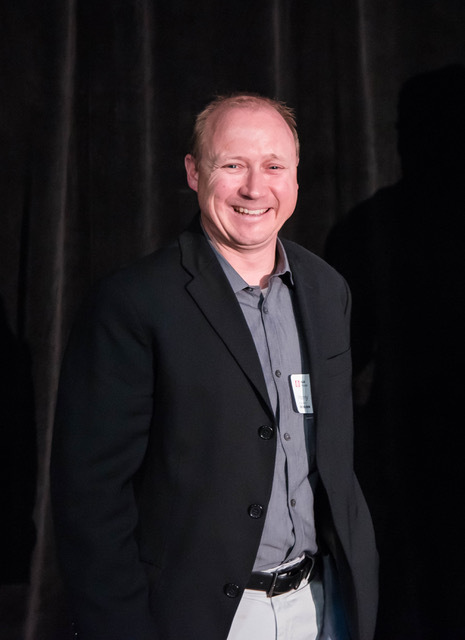 Ryan Kanteres of Scott Simons Architects accepts the award for the Patrons Oxford Insurance Company project. 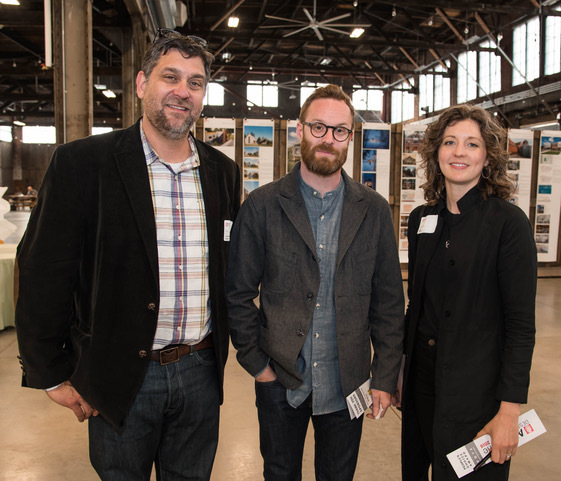 Jessie Carroll and Rob Whitten both of Whitten Architecture, accept the award for Family Farmhouse. Michael Chestnutt and Caleb Johnson both of Caleb Johnson Studio with their award for Green Camp. Matt Elliott of Elliott + Elliott accepts his award for House on an Island. Harry Hepburn of BRIBURN, winner of the People’s Choice award for Single Family/Residential Projects. 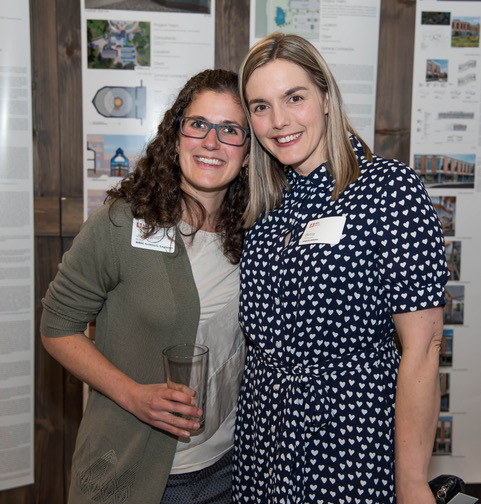 AIA Maine is pleased to announce the honorees of the 2018 AIA Maine Design Awards program. 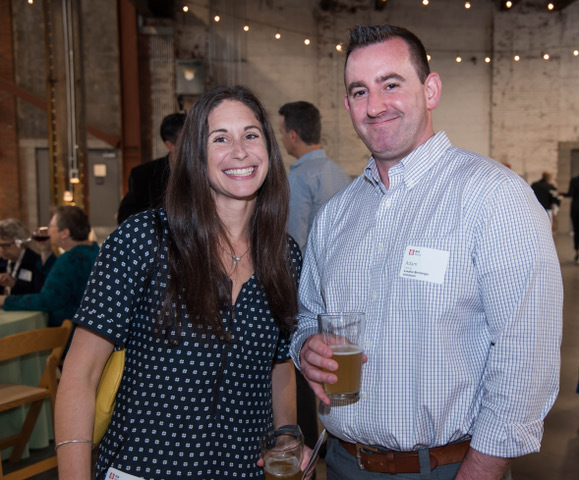 The winners were revealed and celebrated Wednesday night at Brick South in Portland. 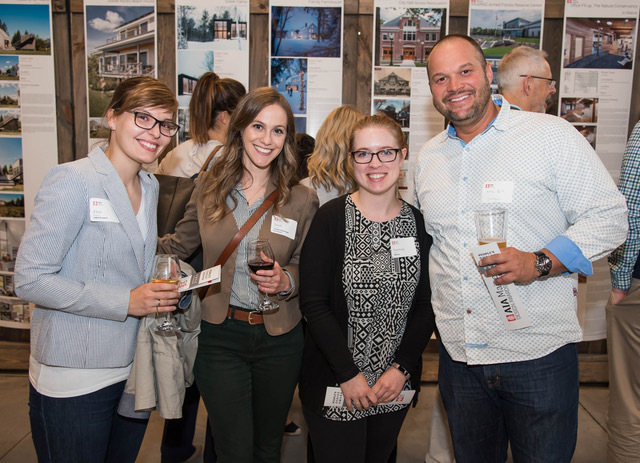 Approximately 170 members of Maine's design community gathered to experience an evening of great architecture and design, showcasing 48 of Maine’s best architectural projects. 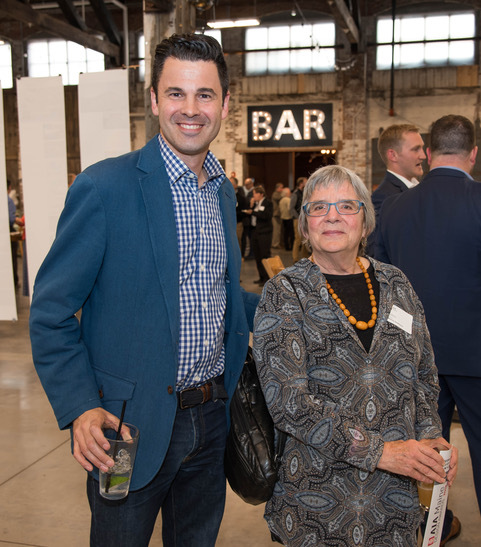 Jessie Carroll, Associate Principal at Whitten Architects and a member of the AIA Maine Board of Directors and Design Committee, welcomed attendees to AIA Maine's 18th award ceremony. 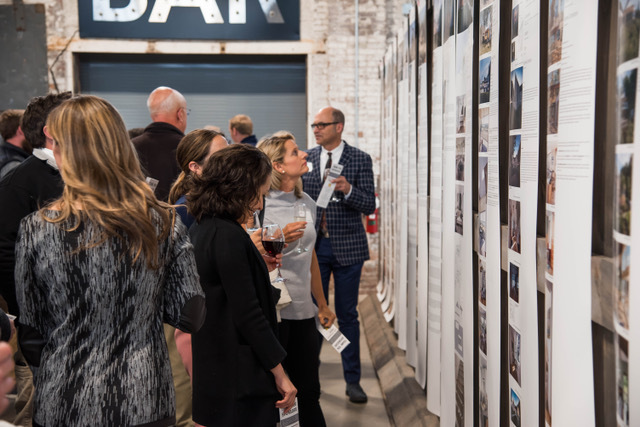 AIA Maine president, Kay Stevens-Rosa announced the winners and shared the jury’s insights about each award-winning project. 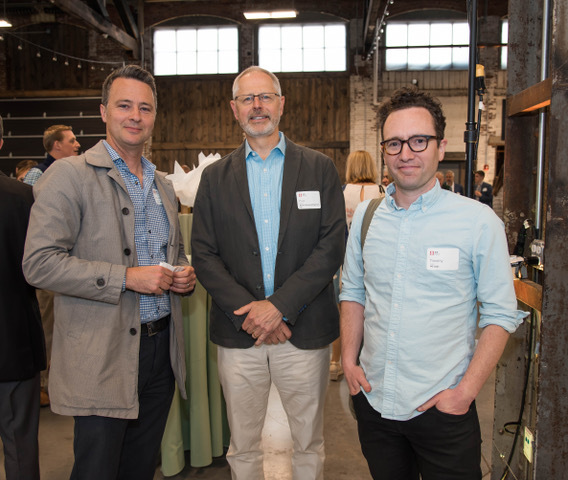 This year’s Portland, Oregon-based jury reviewed the entries and narrowed the group to seven honorees. Jury Comments: "The entire jury appreciated the clarity and execution of this project. 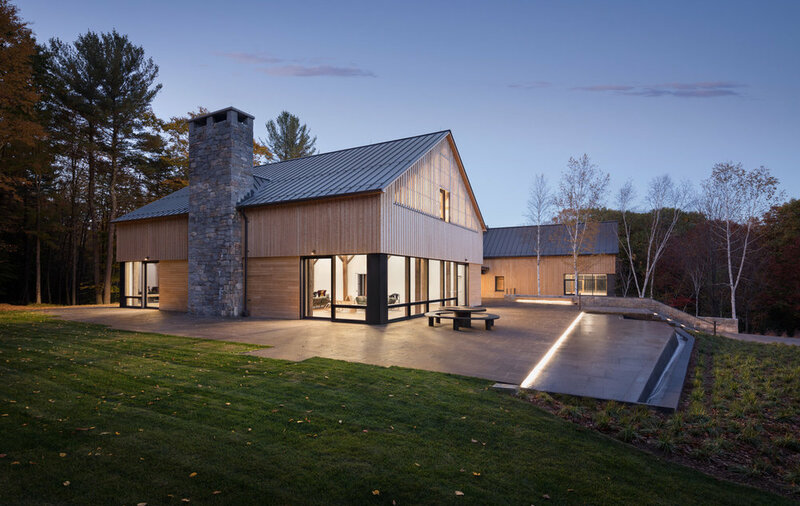 Great care was taken with every aspect of the design - From the way the house, deck and porch are placed in relationship to the existing house and landscape, to the way the interior materials are applied. The design team employed great restraint, including only what was needed so that every piece plays a role in the success of the final design. 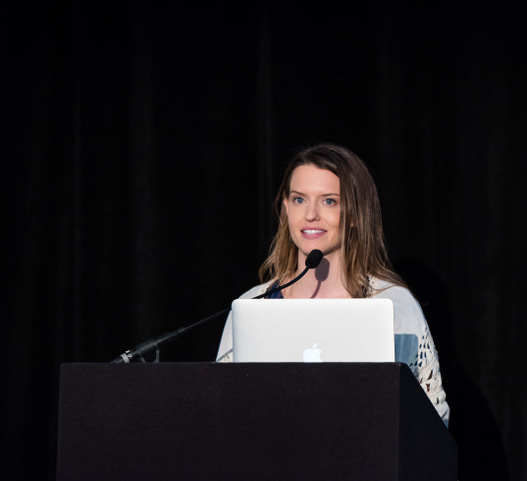 This project is refreshingly simple and perfect." Jury Comments: "From the clarity of design to the way the building was photographed, this project shows that the designers understand the profound power of good site placement, controlled daylight, simple volumes and humble materials. 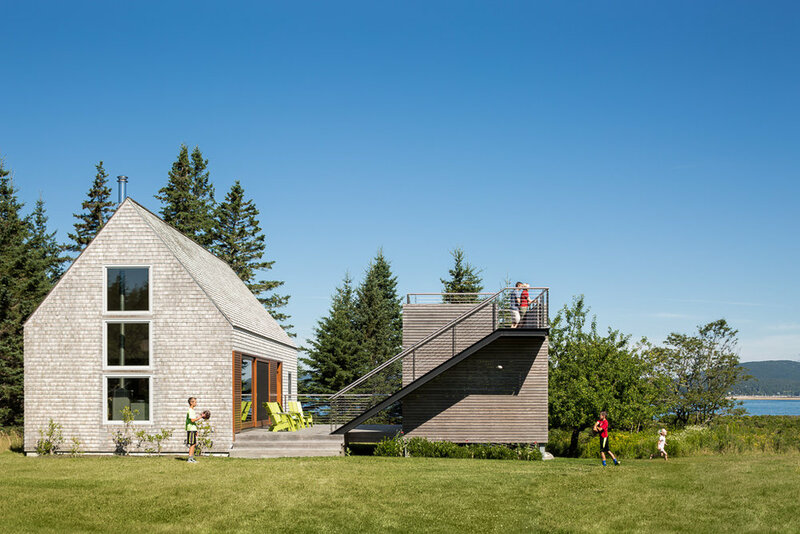 The building is an elegant backdrop for the evolving small family within, carefully sited to create humane outdoor spaces sheltered from prevailing winds and capturing much needed sun." Jury Comments: "The jury appreciated how this project creates a dynamic interplay between the interior and exterior, framing and editing the surrounding landscape while blurring boundaries. The jury also loved how the unexpected finishes and colors further reinforce the connection to nature." Jury Comments: "This project is a great example of how to do more with less to elevate the function and mission of an important organization. Integrating an existing school building and seamlessly enveloping it with a series of new volumes, the project creates a very cohesive, clear, functional and understated collection of spaces. The material palette is extremely spare and economical yet beautiful." Jury Comments: "This project shows how daylighting, natural materials, and connection to nature can greatly improve the experience of workplace design. The uniquely ‘bent’ plan of the building helps to reduce the scale both inside and out while providing more opportunities for views through, across and out to the surrounding landscape. The space is evenly daylit throughout, with large floor to ceiling windows that reduce visual contrast to relax the eyes. The color and material palette is consistent from interior to exterior, further reinforcing the continuity with nature. The Jury also appreciated the attention given to sustainability and energy efficiency. Jury Comments: "The Jury really appreciated how the design team wove this building into the site, working around existing rock formations and settling the building into the existing topography. The use of material completes this idea, with care given to ensuring that materials blend from inside to outside to reinforce the connection to nature. The design team also brought an innovative approach to the program – In this case the mixing of students and visiting scientists was a great insight that offers potential for the informal exchange of ideas and more effective learning. To top it off, the fact that the design is incredibly energy efficient makes the connections to nature even deeper and more meaningful." Jury Comments: "This project presents an extremely careful relationship between site, vernacular form, structure, material and space. Each element contributes elegantly to the story, and the story would not be complete without all of the parts. From the way the buildings rest on the site, the way the massing clusters in familiar ways, to the subtlety of how light passes through the structure, every aspect of this project’s design was considered for how it can contribute to the whole. The jury felt that this project is not only designed beautifully, but it is also an example of how to integrate energy efficiency seamlessly while achieving an extremely high level of craft. Every detail was considered for its ability to weather the inevitable effects of time, providing an opportunity for the patina that develops to enhance the project rather than detract from it. The building is on track to meet Passive House certification, not a small feat given the size and complexity of the project. Creative methods to maintain air-tightness and thermal insulation were integrated throughout yet there is no lack of continuity to the outside and the details are integrated in way that one would have no idea that the building has a high performance envelope." All entries can be found on our 2018 Design Awards site and will travel to various locations throughout the state in 2018. Our warmest congratulations to all honorees, and thank you to everyone who submitted and made this year’s awards program a success. This event was made possible by the support of our generous donors.